What are the origins of Incense? Incense making has been with us since ancient times. Our sense of smell is, frankly, extremely weak compared to most of the animals we share this Earth with, but even so, smell can and does affect us, sometimes profoundly. We don't know exactly when this practice started but history records the first uses of incense making from just about every culture from as far back as we can ascertain. And it's no wonder is it? Think about our Neolithic ancestors in their everyday lives. They would have been surrounded by the natural smells as a normal part of their lives. And some smells would be good and some bad. How was incense making developed? It's an easy leap of the imagination to consider our ancestors deliberately collecting some of the natural matter all about them and deliberately trying to reproduce their smell. And, when wood or other matter was burned on the fire, either deliberately or by accident, the smell given off would be an additional stimulus to deliberately manufacture it. So it's easy to imagine the gradual development of specific 'smell' recipes over time and these being passed from generation to generation. Eventually certain incense became more valuable than gold or silver which led to the development of the Incense Trail and the Frankincense Trail, from the Arabian peninsular to China. What are the effects of incense? Scents act on our brains on a subconscious level. Our subconscious decides whether we like or dislike the smell, depending on its history and associations, and passes this information on to our conscious minds. In fact, the scents are first detected and analysed in the limbic part of our brains, which is the oldest and most primitive part. We probably don't realize it but our reactions to scents go deep, really deep, and can affect us on a profound level. The limbic system is considered to be the basis of our memory and can affect our moods to a powerful level. 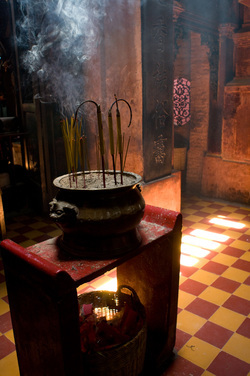 Nowadays incense is used for multitudinous reasons including, religion, meditation, aromatherapy, shamanism, pleasure, purification ceremonies, magickal rituals, creating a mood, insect repellent and let's not forget the masking bad smells use as well (such as it's use in funeral homes of various cultures). Generally, there are two types of incense, direct burning and indirect burning. Indirect burning incense requires a separate heat source (typically an incense burner) which heats the powder thus producing the smell. Direct burning incense are, as the name suggests, directly burned. The incense, in a solid form, is lit which gives off the smell. It's a strange fact that some incense ingredients only give off their smell when heated. I sometimes wonder how these ingredients were discovered. What are the incense ingredients? The ingredients used throughout history have varied widely. Typically, local ingredients were used which limited the smalls available and the method of manufacture. Once trade routes were set up, and remember the earliest trade routes are from our pre-historic past, information flowed from one community to another. With this information came trade and the incense effects and manufacturing techniques were passed from community to community. Thus a worldwide incense trading network was set up very quickly with ingredients being manufactured and shipped to all corners of the world as known by the peoples of that time. This resulted in the modification of the local preferences and in the implementation of new methods as the artisans were introduced to new and novel ingredients and methods. How is Incense used in Magick Ritual? Incense has always been used in all manner of religious ceremonies. It is seen as an offering to an entity or archetype Godform often, or generally just used to set the mood of the ritual. Using tables of correspondence we can choose which herbs and resins are right for the emotion we want to evoke, or entity we want to invoke to bring it's essence to whichever particular working we are doing. How does Incense effect our health? No-one denies that the contaminants contained in incense smoke are carcinogenic as they contain gaseous pollutants as well as particulate pollutants. There have not been many studies on this potential problem, but from the ones that have been undertaken, it appears that this is not a major risk factor. The risk will be increased with exposure and this appears to result in a small risk. On the other hand however, it is reported that the use of incense does improve moods in people. This is from users statements and as such is not scientifically validated. Frankincense has been scientifically proved to alleviate anxiety and depression in mice. What about ready made incense? Ready made incense can be handy and is easy to use. It might not be as satisfying as making your own, however sometimes we just don't get the time, unless making extra effort for a ceremony or special occasion.